A rather attractive Japanese woman with shaggy, shoulder-length, bright cherry red hair and hazel green eyes, making it easy to mistake her as Brazilian (Pro Tip: Her Double E breasts don't help the argument that she is Japanese-American, not Brazilian). Her usual clothes vary from something that looks vaguely 'new age' Terry Bogard (flight jacket, white tee, bluejeans) to oldschool Blue Mary (Red top, baggy bluejeans, steel toed boots and biker gloves), and even at times dresses professionally (Vanessa from King of Fighters). Shishio is an incredible guitarist! She can take apart and put back together her bike in a matter of 24 hours, barring she has the tools (and possibly materials) to do so. She's also great at fighting games, and has mastered Marvel vs Capcom 2. Her best characters are Spider-man, Jin and SonSon. Shishio's main claim to fame though is that she knows how to fight. Her fighting style consists mostly of kicking, including the difficult and stylish butterfly kick, with some short punches and elbow/knee jabs, making it resemble a street fighting-ish Muay Thai kickboxing or a more practical/less kata-centric Taekwondo. Shishio has been (lightly) trained in ninjitsu, and, should she again gain the ability to use her (woefully low) chakra (she had to use a special suit of armor last time), she will regain the ability to air walk, and use the substitution technique. The Variable Rider System (normally called VRS) is a belt which, when activated, forms one of seven Rider armors onto the user's body. Each armor has it's own strengths and weaknesses, but the Rider is not restricted to just one per mission. By switching back into the Adapt mode, the basic armor described above, the user can either choose one of the suits already created, or attempt to feed the system data on the current situation, which will create a new armor (such as a fire-retardant one during a firestorm, a suit for going outside the ship in space or alien enviroments, it's capability to adapt is only limited by GM discretion). Armor: Armor is only good for deflecting a regular human's physical assault. Armor: Light, flexible armor, capable of withstanding modern handheld gunfire and energy attacks, but in no way 'shrug off' any armor outside of a regular human's physical assault. Armaments: Photon Saber x2, can be combined to form Photon Zweihander x1. These energy swords have two settings, that of an electric stun baton and then the actual, deadly energy form that can slice through most mundane materials like butter. Special Ability: Can 'clock up', increasing her perception and speed to the point that it seems 1 second is 10 seconds. Effect lasts for 3 seconds real time. She can break this up into 3 uses, but as she's still very new to the system, she'll have to adjust to it. The suit requires 24 hours to recharge after using this ability. Armor: Balanced, not too heavy, not too light, can withstand medium-strength modern firearms and energy attacks, absorbs heat/fire to charge up attack coils. Armaments: Attack Coils x9, one on each fist, elbow, knee, foot, and one in the middle of her chest. 4 other forms to be filled in! Fist Form Speed: 390 mph, treads on tires allow it to ride up vertical surfaces, boasts Attack Coils across the back, both which allow it to be used offensively. The quintessential Kamen Rider motorcycle, this bike is actually the bike she's had for a number of years, remodelled to work with the VRS. When Henshin'd, it takes on the color of the suit in use and sometimes the abilities (such as using the Rush suit while riding would double the speed of the bike). It's normally pearl orange and black with a number of bumperstickers plastered to the front chasis. Shishio was born in Japan to two influential members of the superhero society in her universe... that were killed by foul play. While Shishio was the next target, her parents' friends helped her escape by sending her to America, where she was adopted by a kind Mexican immigrant, and given the name Elysse Parcerra (Parker in English). Shishio lived a regular life, up until high school when the town she was 'born' in was attacked by an evil space witch, and the world at large was introduced to superheroes who the media had dubbed 'Power Rangers'. Thanks to divine coicidence, Shishio's life was caught up in this mess. First she was the vengeful sixth, then integrated into the team for a while, until an incident forced her to leave Angel Grove. Over the next few years, she was swept into other 'incidents', moving up in the ranks of the team until, while heading back to Angel Grove, became a leader of a ragtag band of ninjas. After this, she decided to retire, return to Angel Grove and try to get her life back together... when she was called to Japan by her on again off again love interest, as something was stirring in the East that the heroes there thought she should be apart of, considering her original parents. 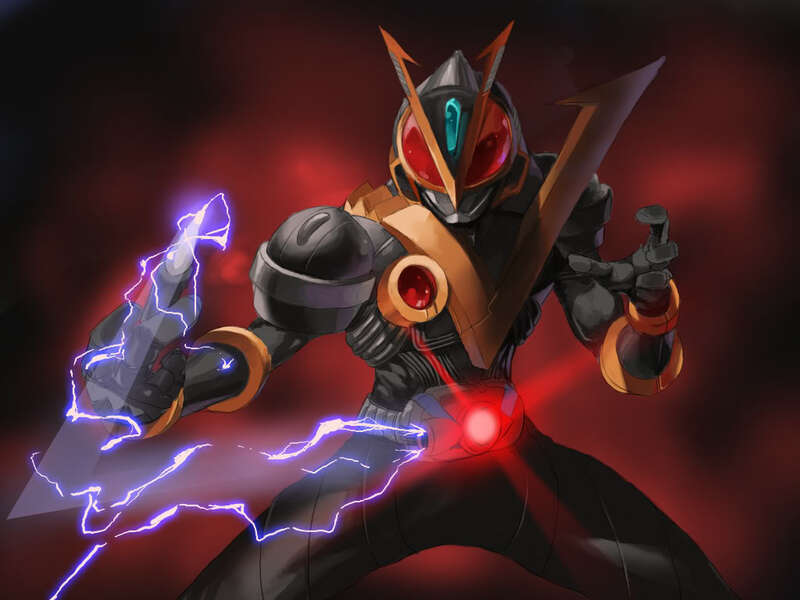 While off on this voyage of discovery, only a few weeks after being fitted with the VRS suit by the legendary Kamen Rider scientist, Takeshi Hongo, she... wound up on the Blaze of Glory. While she has some suspicion that whatever shunted her out of her universe is tied to why she was brought to Japan, she doesn't seem totally concerned with getting back -- sometimes the multiverse needs the best, and that's why she's there.